Here is another example of "Apartment 3G" by Alex Kotzky, won in auction at Heritage Auction (comics.ha.com) for less than $100 each a year or 2 ago. I assume they are by Kotzky himself and not a ghost; the lines delineating the characters seem to be drawn more with brush, less with croquille pen. I discovered Kotzky in as a 13 year old in 1972 when I received a subscription to The Menomonee Falls Gazette as a Christmas present. 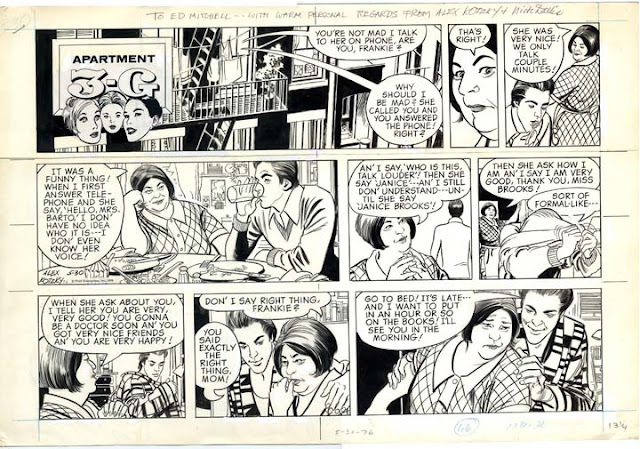 What I loved about Kotzky was his ability to draw likenesses of various people and keep them consistent; "How does he DO that" my adolescent mind burned to know, as it did similarly with Al Williamson, Neal Adams, and Doug Wildey who also had ongoing strips in that magazine. I didn't learn until art school that they swiped from photographs, undoubtedly posing models to match the compositions of their panels. Kotzky has his own flavor of this; whether or not it's true, his work FEELS to me like he drew it from his own imagination. It's not a quality of the ink technique; Wildey also had an agreeably rough-hewn ink style, but his work is obviously photo-ref. Perhaps it's the dynamism of his staging. I would have to look at Wildey again to form an opinion. I especially love the mother character, her design and her acting as contrasted with the design and acting of the son character.